Four years ago homes and businesses along the east coast of England were flooded in what was the most significant sea-surge generated flood in half a century. Since then the Water Management Alliance (WMA) in East Anglia has been working with partners to provide a long-term, strategic solution. A partnership between WMA and Selwood’s pump rental and sales specialists has helped to improve flood resilience in the region for years to come with the provision of cutting-edge pump equipment. WMA administers several drainage boards across Norfolk and Suffolk, including the Broads Internal Drainage Board, which oversees more than 50 pumping stations in the low-lying area. The pumping stations are operational all year round and manage water and flood levels across a vast inland network of waterways, ensuring that people, property and areas of international environmental importance are protected. In the event of a pumping station breakdown, the Board was vulnerable to not being able to easily manage day-to-day pumping requirements, or worse still, cope with a major tidal or fluvial event. A need was identified for a higher level of strategic resilience within the board’s pumping network and instant emergency back-up support. Furthermore, superior pumping equipment was required for an on-call deployment service for the Lowestoft Temporary Flood Barrier, an interim solution for the protection of Lowestoft town centre from tidal flooding until a much larger tidal barrier and defence scheme goes live around 2021. The temporary flood barrier system, approximately 1400m in length at five discrete locations in the town centre, had a requirement to pump small amounts of floodwater that might leak during a large tidal surge event. The water collecting in gullies and drains would need to be constantly overpumped during a tidal surge. After a selection process, Selwood was chosen as the preferred supplier. 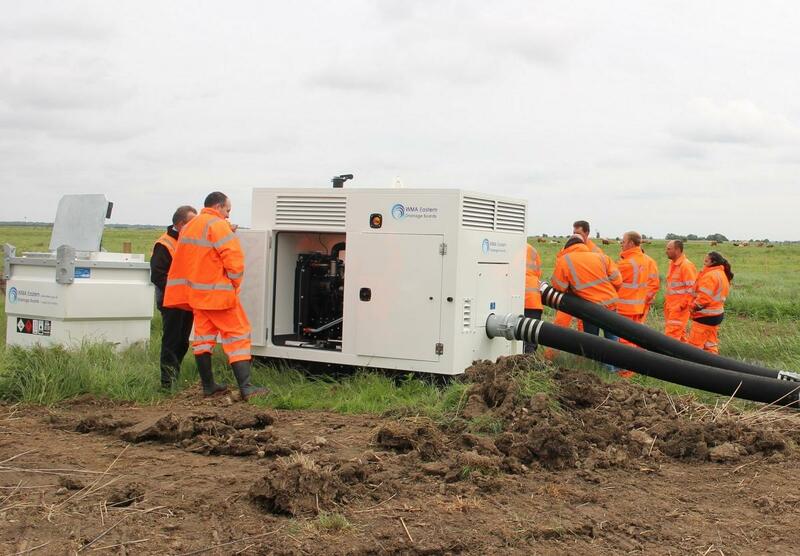 Working closely with Selwood’s specialist team, who carried out site visits to tailor their pump technology to the specific needs of WMA, the D200 was identified as the ideal model for the application. Selection of the D200 was aided by a trial demonstration and careful balancing of operational needs to equipment type and availability. Four D200 Super Silent pumps were supplied, having a number of specific features for addressing the complex needs of WMA. The model offers high efficiency centrifugal pumps for high-volume fluid transfer, whether it be clean water or tidal water with fine or larger solids. Capable of handling flows of 600m3/h, these highly efficient Selprime pumps offer emission compliant engines, are easy to operate and maintain and have a robust construction that can withstand harsh conditions. The addition of Selwood’s Super Silent technology was the perfect partner for this application in a densely-populated urban area. 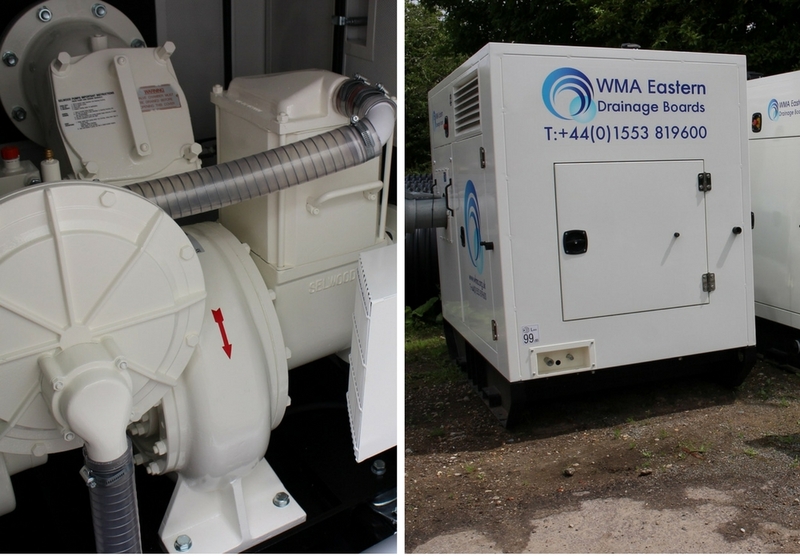 The pumps were supplied in the WMA white colour livery scheme with secure Super Silent canopies to minimise the possibility of any noise issues with the D200. Designed using premium materials and Selwood’s six decades of pump manufacturing experience, the longevity and quality of the D200 gave WMA and its partners confidence that they were investing in equipment they could rely on. Together with its installation and maintenance service, Selwood also supplied hoses and accessories. Backed by a 24/7, 365 days-a-year emergency callout system and a comprehensive network of branches in the UK, including a local branch in Great Yarmouth, it gave WMA peace of mind in the long-term value of the product in case repairs were ever needed. The simplicity of Selwood’s products, ensuring simple on-site maintenance and less downtime, was important to WMA. Since taking delivery of the four 200mm pumps and associated equipment the units have quickly been deployed to two large capital projects in Norfolk and Suffolk. Pete Roberts, Operations Engineer for WMA Eastern, said: “Many of our WMA and Broads Internal Board personnel have long-standing knowledge and use of Selwood products, so there was certainty in the product and service. “A key benefit is the local backup and quick turnaround for post-purchase support. A competitive price was also reached against other suppliers through the open tender process. “The units are performing admirably and have made the pumping and water level management exercises needed as part of large capital flood defence and water transfer projects more efficient and easier to complete. A training exercise is planned later in the summer or autumn to test the deployment of the Lowestoft Temporary Flood Barrier. This will involve a timed deployment by WMA and Waveney Norse personnel, practising barrier erection and the installation and testing of Selwood pumping equipment at one of the five temporary barrier locations.